Many galaxies have a giant black hole at their center that causes the gas around it to glow. However, in the case of green bean galaxies, the entire galaxy is glowing, not just the centre. These new observations reveal the largest and brightest glowing regions ever found, thought to be powered by central black holes that were formerly very active but are now switching off. Astronomer Mischa Schirmer of the Gemini Observatory had looked at many images of the distant Universe, searching for clusters of galaxies, but when he came across one object in an image from the Canada-France-Hawaii Telescope he was stunned — it looked like a galaxy, but it was bright green. It was unlike any galaxy he had ever seen before, something totally unexpected. He quickly applied to use ESO’s Very Large Telescope to find out what was creating the unusual green glow. The new object has been labelled J224024.1−092748 or J2240. It lies in the constellation of Aquarius (The Water Bearer) and its light has taken about 3.7 billion years to reach Earth. These galaxies signal the presence of a fading galactic center, marking a very fleeting phase in a galaxy’s life. In the early Universe galaxies were much more active, growing massive black holes at their centers that swallowed up surrounding stars and gas and shining brilliantly, easily producing up to 100 times more light than all the stars in the galaxy together. Light echoes like that seen in J2240 allow astronomers to study the shutdown processes of these active objects to understand more about how, when, and why they halt — and why we now see so few of them in younger galaxies. After the discovery, Schirmer’s team searched through a list of nearly a billion other galaxies in the Sloan Digital Sky Survey (SDSS) database, and found 16 more with similar properties, which were confirmed by observations made at the Gemini South telescope. These galaxies are so rare that there is on average only one in a cube about 1.3 billion light-years across. This new class of galaxies has been nicknamed green bean galaxies because of their colour and because they are superficially similar to, but larger than, green pea galaxies. In many galaxies the material around the supermassive black hole at the center gives off intense radiation and ionises the surrounding gas so that it glows strongly. These glowing regions in typical active galaxies are usually small, up to 10% of the diameter of the galaxy. 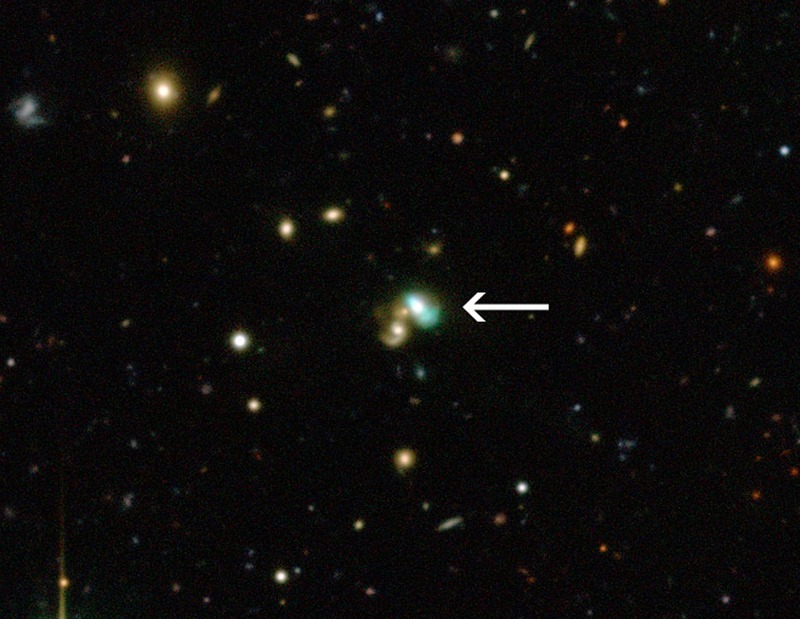 However, the team’s observations showed that in the case of J2240, and other green beans spotted since, it is truly huge, spanning the entire object. J2240 displays one of the biggest and brightest such regions ever found. Ionised oxygen glows bright green, which explains the strange color that originally caught Schirmer’s attention. The team’s further analysis of the data soon revealed another puzzle. J2240 appeared to have a much less active black hole at its centre than expected from the size and brightness of the glowing region. The team thinks that the glowing regions must be an echo from when the central black hole was much more active in the past, and that they will gradually dim as the remnants of radiation pass through them and out into space.